The Echo-X is a perfect blend of untameable and controllable. 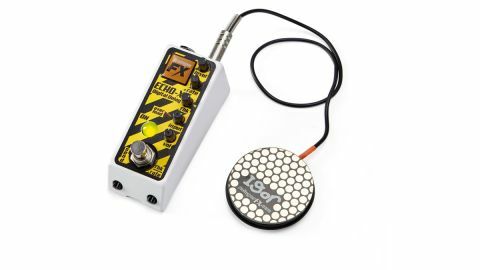 It makes some of the UK's most eccentric pedals, such as the Dr Freakenstein Fuzz, but recently Rainger FX has focussed on mini-pedals, and the Echo-X is the latest - a digital delay with real-time control, courtesy of the included Igor pressure pad. First, a whistle-stop tour: level, rate and feedback handle your usual delay duties, while input controls the input level and volume handles the overall output. Two push-buttons determine the Igor's functionality: push the right button in to adjust feedback, out to adjust rate. The left button activates the send function: this leaves your signal dry until you step on the Igor, which re-engages the delay; step off and the pedal loops the current repeats so you can play unaffected over the top - great for atmospheric intros. It all adds up to a wealth of entertaining pitch swoops and oscillation revs, although the core delay tone is pretty tasty, too, courtesy of the PT2399 chip (as used in many boutique delays), which delivers a slight low-and high-end roll-off for an analogue flavour. 540Ms is your max delay time, though repeats tend to get a little crunchy beyond 350ms.